Before I talk about Foxcroft, I should say, thank you to everyone who let me know about my site and wondered when it would be up. It has been a technology nightmare! The Data Center that hosts my blog, along with about 1,000 other sites had a major outage and had to restore all of the sites. This took days. I was so frustrated, and fortunately, with all of the glitches that also came along with getting the site back up, I have a very very patient IT hubby, that kept me more calm. It took so much time as they had to restore everything and there were mistakes made. Anyhow, it seems things are back in order. But I will need to work on the posts that I lost. Who here loves to iron? Maybe you consider to be like gardening-relaxing and rewarding seeing the outcome. A crisp, newly pressed fresh shirt. Or, maybe you would rather just have shirts that don’t wrinkle! I go for door #2. When Foxcroft contacted me about a collaboration, I decided to choose 3 different shirts for a variety of looks in my wardrobe. These shirts are non-iron or wrinkle-free, which sounds good to me! What else makes me happy besides not having to iron? Having a good hair day 🙂 I started to style my hair with my hot rollers again and you see how much volume there is. 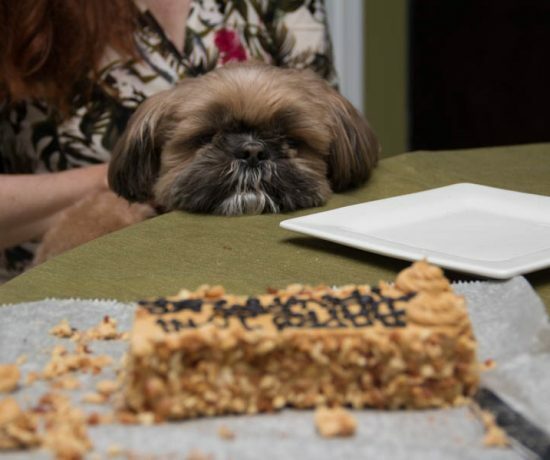 Had to share. 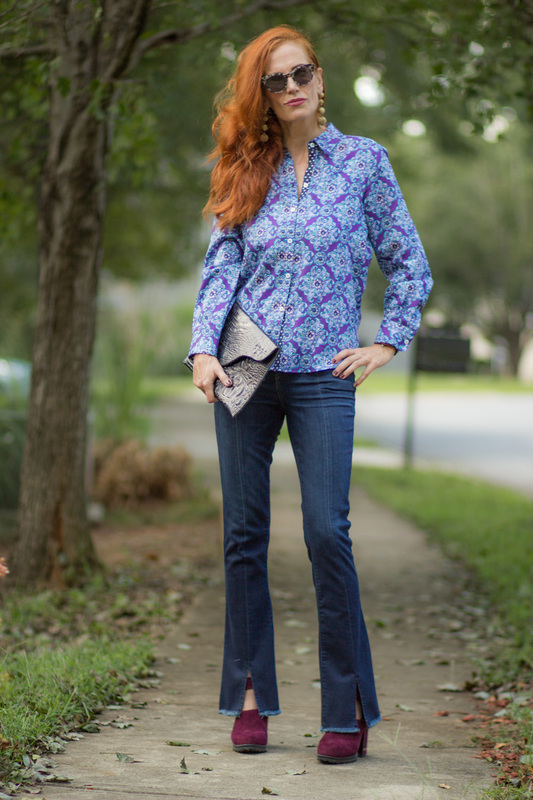 I liked the vintage vibe and colors in this Ava Wrinkle free Medallion shirt from Foxcroft. I am wearing a size 4 and it is roomy. The sleeves and collar area have a different polka dot pattern. Pattern mixing built-in. Isn’t that cool? I also like that the shirts are shaped at the bottom, giving the button down a more feminine cut. 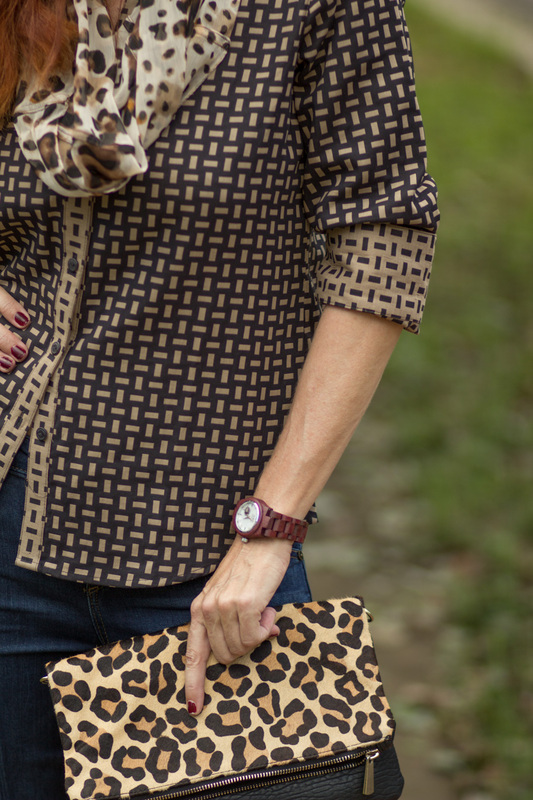 A print mixing neutral look with the shirt, leopard scarf and leopard textured clutch. I kept the patterns in the same color family. Adding my Mango tan booties for a Fall look. As the weather gets cooler, i would add one of m blazers or moto jackets with this style. I like the alternating dark pattern with the lighter tan pattern at the sleeve and buttoned area. It’s details like this that make these shirts more than just a button down. . The Mary Double Faced Jacquard shirt is part of their Fashion line. I think I gave it a bit of a 70s vibe here.. Platform suede shoes by Jambu and the print. Now, where is my fringe bag? It’s so funny as I try for different poses, but my dad with this darkroom when we grew up had me smiling all the time. I am not used to “not smiling” in my blog photos! in a size 4. 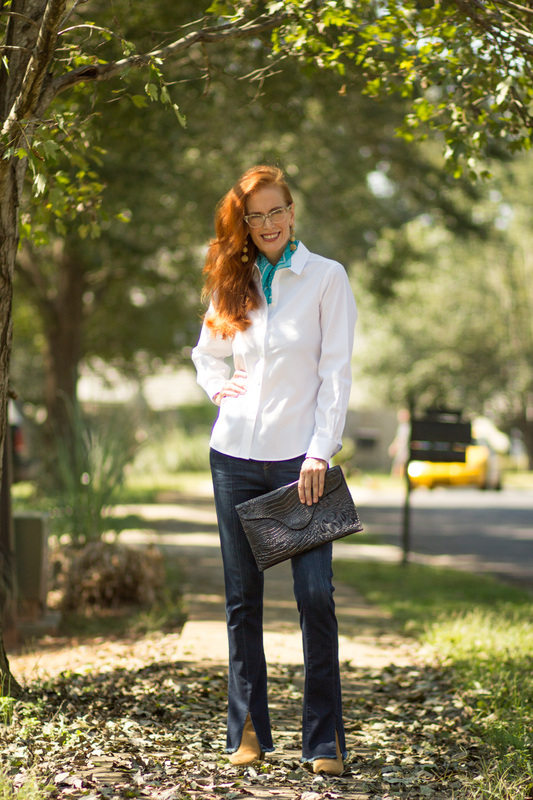 Every lady needs a classic white button down in their wardrobe. 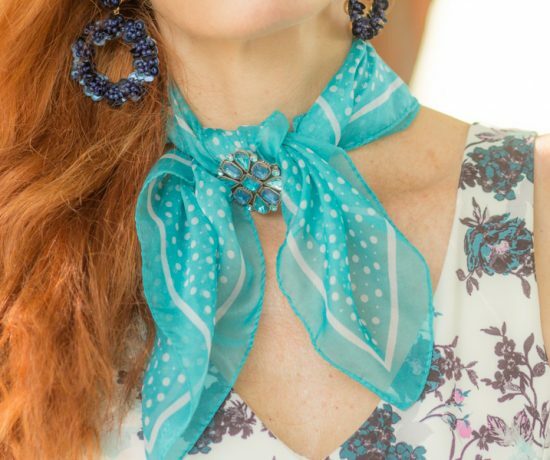 These shirts are great on their own, with pearls or worn with a neck scarf. Great shirt to pair with a smart blazer for Fall. 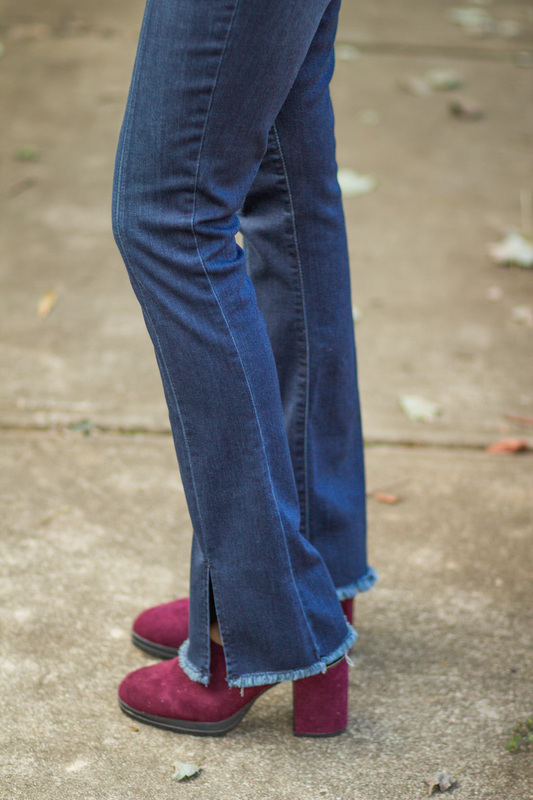 This is one staple you will want for year round wear. I am wearing it here with a silk neck scarf. So, if you are looking for wrinkle-free and non-iron shirts, Foxcroft has a great collection. Which style appeals to you? Do you have the closet staple- a white button down? 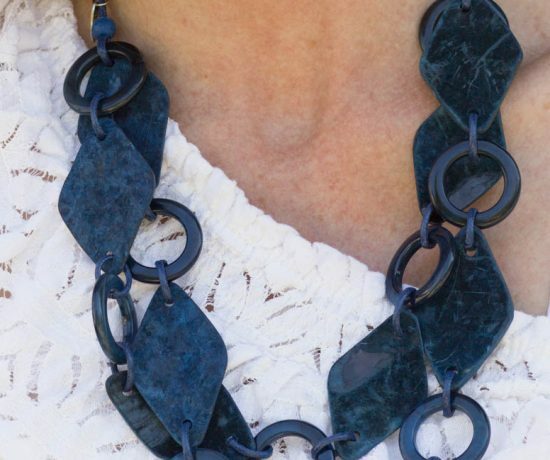 STOP BY TOMORROW FOR TURNING HEADS TUESDAY WITH A DISCOUNT CODE FOR READERS. *c/o These shirts were gifted to me by Foxcroft NYC. All opinions are mine and truthful. Jess, I love all three outfits! Those jeans are spectacular and you hair looks gorgeous styled that way! Love it all. And what a nightmare with your site being down. It is never a good time for such a thing, but I am glad to see that you are back up and running! Wrinkle free. Thats what I like! 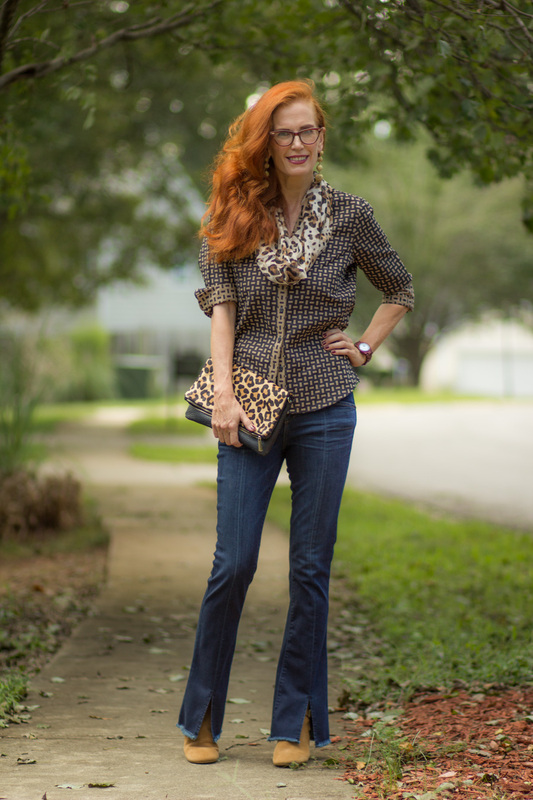 I love the mixed prints in these shirts but Im really loving the spilt hem jeans!!! Hi Jess, I had the similar problem with my website few years ago, unfortunately the host company lost it forever and my web designer had to rebuild it from scratch. So consider yourself lucky. Second, your hair looks amazing, thick and luscious. And last but not least, the shirts are lovely, the one in the middle (black and brown print) seems to be my favourite. Great styling, as always. I am DYING over these looks Jess! I want all three shirts, the denim, and those Jambu platform shoes. Which ones are they and where are those jeans from? 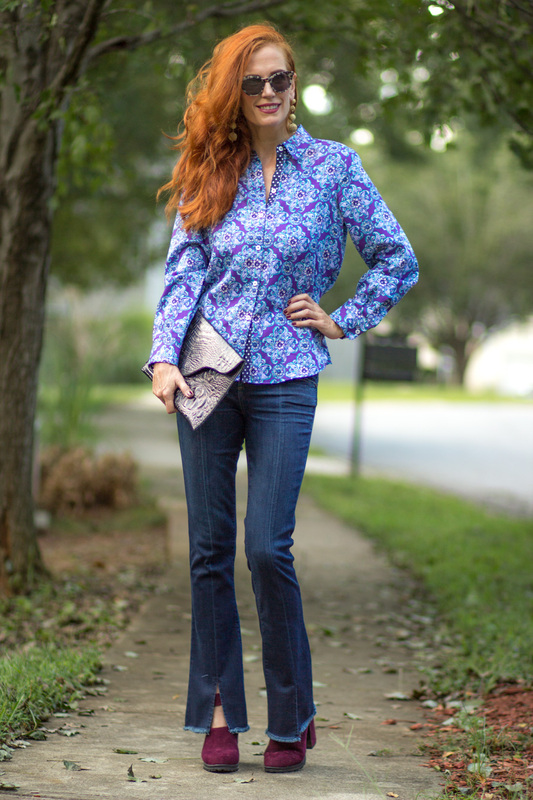 Gosh I love a blouse with built in pattern mixing and my heart skipped a beat at no-iron! Rockstar gorgeous my friend! Oh horror! My site has to be migrated one of these days, but I am so scared of it! Your second blouse is fabulous! I love the colors, and isn t it great that it doesn’t t need ironing! Yeah! I hate ironing. Glad your site is back up. Tech stuff like that is a nightmare and so stressful! It is good that you have a techie guy at home. I *wish* my hair would keep volume like yours. The only way it works is if I do a wet set which means I’m sleeping in pins and curlers. Not fun. Hi Jess! I tried to comment on your last post but for some reason I couldn’t get the comment to go, so I’m trying again today! I really really love these shirts…especially the colors in the first one. I’ll definitely be checking into these further. 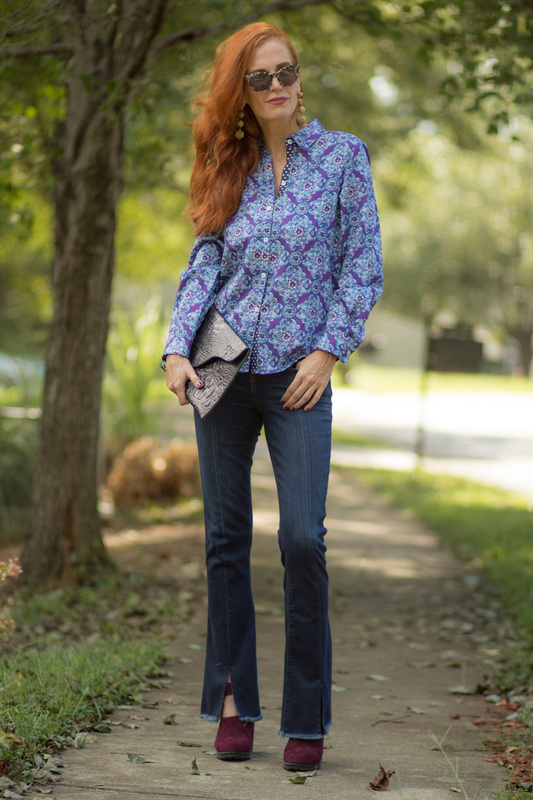 Fall is the perfect time to wear blouses. Hope you’re having a great week! I’m glad your site is back up….that’s such a crazy thing! And no iron?? Everyone appreciates that. They are all so lovely!! You had me at non-iron Jess!!! The shirts are absolutely gorgeous – I do love a shirt that doesn’t wrinkle and that fits well like these. Sorry to hear about the nightmare with your site. Glad to see it’s back and running now though. Have a lovely rest of your week!